It just hit mid-July and the summer’s scorching heat is making you retreat to the confines of your air-conditioned living room, but with summer vacation, the kids are desperate to play outside, which is why you keep hearing the phrase “I’m bored.” Sound familiar? At this moment you’re probably putting together a list of responses and dreaming of finally building that swimming pool for the backyard so that the family can once again enjoy the sun and heat that summer so generously provides. If you’ve finally made the jump to designing the pool for your backyard, travertine is a perfect choice for pool decking, not only for beautiful aesthetics but also for functional reasons that will keep you in the pool area for long hours. You’ll no longer hear the phrase “I’m bored” again because both you and your kids will be pleased with your choice of a travertine designed pool area. Besides our gallery, there are plenty of travertine pool deck photos online to help you with ideas. There are several pros when it comes to designing your new pool with Travertine pool deck. Read our list and find out if it works for your space. One of the biggest concerns when it comes to swimming pool surfaces is if it will prohibit children from slipping and falling on a wet surface. The outer surface of your pool is bound to get wet, but with travertine’s porous nature, the water is absorbed making it not slippery. The holes that are naturally occurring as a part of travertine’s facade easily retain the water that is pushed to the surface while you’re enjoying the pool. The absorption also makes it more difficult for water to remain in puddles or flood the inside of your house. It is also a good choice if you’re in a place with high amounts of rain, the travertine pool deck once again will prohibit any runoff or flooding. If safety is an important issue for you, a travertine pool deck has you covered. Not only does it prevent slips and falls due to its non-slip surface, but also it is heat resistant. If you live in an area with temperatures exceeding 85 degrees, have no fear – travertine decking will keep your feet cool. Travertine transfers the cool, low temperatures from the Earth underneath while reflecting the sun’s rays. 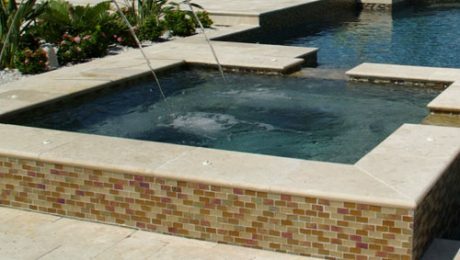 The movement of cool air allows travertine’s surface remains cool to the touch, which is great when you want to have BBQ’s or play in the pool midday without the worry of people burning the bottoms of their feet. Not only is travertine good for safety, but it is also well known for being durable and can withstand high heat. It doesn’t matter how high the temperature gets in your city, travertine is naturally made to last. 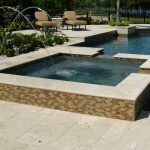 There is sometimes confusion between indoor travertine (or travertine tile) and outdoor travertine (or travertine pavers) but the type of travertine that is used for pool decking is travertine pavers, which are thick and durable. This is also true in extreme weather conditions such as heavy rain or sleet. Rocks, spills, shoes, or whatever it may be that you want to move by the pool also won’t damage travertine decking. The durability makes it an easy choice when you want to enjoy your backyard and won’t get ruined when you have parties, bbq, or move patio furniture near the surface. Travertine drives a hard bargain. It looks nice, won’t get ruined easily, can withstand the heat, is great for safety, and is extremely functional when it comes to design – but there is one drawback for travertine pool decking, and that is heavy snow. Unfortunately, one of the cons of travertine is, although the pores make it easier to absorb water (which is beneficial during hot summers), when it snows or if rain turns to ice in cities with long, cold winters, the travertine material may expand and get damaged. Although this may be problematic, you can reduce the chance of damage by the type of travertine that you purchase. Selecting a travertine pool decking with smaller holes can prevent the travertine from expanding. 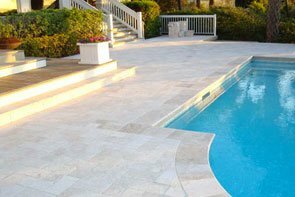 If you have any questions about which travertine is right for you, or want more information about the types of travertine for your next swimming pool or other project, feel free to contact a Travertine expert at Texas Travertine: (855) 588-7272. Travertine comes in many different patterns, thickness and cuts, sizes, and variations depending on your next project. Choosing the right type of style of travertine from pavers to tiles, split face or standard mosaics, and moldings and copings are important for the functionality of your project, but travertine pavers are a great choice for any outdoor needs you may have. Travertine pavers are durable, long-lasting, can withstand fluctuating weather conditions, and its porous nature – which easily absorbs water – makes travertine’s surface cool to touch. These characteristics make pavers the most popular choice of travertine for walkways, driveways, areas surrounding pools, decks, and patios. They are a cost-effective solution to expensive alternatives and have the benefit of being environmentally friendly and won’t lose their original color. Travertine Pavers are also distinct from travertine tiles due to the thickness of the material, which ranges from 1 1/4 – 2″ inches thick and are cut into blocks. Pavers are usually rough to the touch and have chiseled edges, unlike tiles, which have a smooth finish. Pavers are likely to be installed on top of sand and gravel and mortared (a mixture of cement, water, and sand laid beneath the stone) on mud due to the thickness of the material. Travertine pavers can be arranged in any formation and cut in a distinct pattern based on your needs. They can be finished in three ways: tumbled, honed, and polished. A tumbled finish is designed to look “worn in” or rustic, so the travertine is tumbled to provide more texture. This process can take 3-5 weeks and requires the travertine to be coated with rubber or plastic barrel with grit and water. The holes in the travertine can be filled or unfilled depending on the look you want to achieve. A honed finish appears glossy and has a matte or sheen look with a smooth texture. In order to achieve a honed finish, the travertine is ground on one side. Travertine with honed finishes are the most common in the United States are frequently used in bathrooms and outdoor patios. A polished finish requires filling the holes in the travertine. Similar to the honed finish, the travertine is sleek and smooth to touch. and red coloring. Noce pavers are a great way to make your space more vibrant and sunny. Silver pavers usually consist of darker hues of grey and white and have speckles of black coloring within them, adding a unique touch to any design. Pavers also come in ivory, country classic, walnut, scabos, tuscany, and many more. Consult Texas Travertine for help selecting the best color for your project. When weighing the options for planning the design of outdoor spaces, people typically go back and forth between travertine and concrete pavers. Travertine pavers can typically only be cut into squares or triangles, but the characteristics and unique appearance make it a much aesthetically appealing choice. Although builders may try to replicate travertine pavers’ natural appearance, concrete pavers simply won’t achieve the same look because it is man-made and not all natural like travertine. Concrete pavers also come in pieces, 2 ⅜” thick, and require more finishing to achieve the same texture as travertine. The surface temperature is also a big factor when deciding whether to buy concrete or travertine pavers. 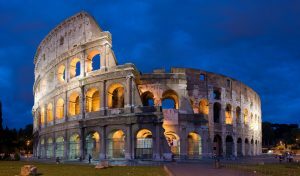 Travertine is usually 20% -30% cooler than its concrete counterpart, once again due to its porous nature. This fits in well with safety requirements and won’t be a cause for concern during hot summers. Travertine pavers within pools are also non-slip and can be sealed to prevent mold and deterioration. Concrete pavers are not protected during extreme weather conditions and are likely to crack in freezing conditions. Also, rain, sleet, and snow can cause the color to fade, so this will require re-staining every 2 years. Travertine’s colors are naturally derived from the Earth, so there will be no need to stain the surface. Travertine pavers also don’t require lengthy installation times and is a stronger material than concrete pavers. To get a better idea about how much a travertine install might cost in your area, you can check the typical cost considerations over at Home Advisor. There are many great advantages of using travertine pavers for your next project. But if you have any questions at all, please feel free to give the experts a call at Texas Travertine: (855) 588-7272. Dug from large quarries in Turkey, shipped to the United States on a cargo ship, driven to our warehouse for distribution, then delivered across the country (well, depending on your location) by truck to you – stone distributors in the United States don’t have travertine on hand and it travels a long way to arrive at your doorstep. Here’s how we get travertine directly to your location, so you can get started on your project right away. Wondering where Texas Travertine gets its high quality travertine that comes in an assortment of colors and is found in very few places in the United States? At Texas Travertine we are the single largest producer of travertine in the United States and with 13 of our own quarries in Denizli, Turkey we don’t require a middleman, unlike other distribution companies. Texas Travertine only sells Turkish travertine because compared to other places in the world, such as Peru, Mexico, and Italy – Turkish travertine is more abundant, dense, the highest quality, and has the most expansive range of colors in the world. Travertine is located underground and is dug from one of our 13 quarries and then delivered to our 3 factories for distribution within the United States. Travertine has to travel a long way to get to you because there is a very small amount of domestic travertine and it is not as dense, which is less ideal for building or a remodel. As the only one of the five sellers in the United States, we want it to be easy for you to get high quality travertine at a low price and with no minimum or maximum amount you are required to buy, so that your project turns out perfect. We get a shipment of Turkish travertine delivered to our warehouse in Houston, Texas once daily. We don’t waste time once the travertine is dug from our quarries. It is briefly stored in our factory and then shipped directly in a cargo container to the Port of Houston. You shouldn’t be required to wait months to get started on your project, which is why we have a significant amount of travertine stored in our warehouse. All of our travertine is ready for delivery as soon as you want with no limits on how little or how much you can buy. Bulk orders do require some wait time, which is as little as six weeks; custom orders are about 10-12 weeks. With our roots in Turkey, we continue to maintain a strong relationship with our factories and quarries there so we can continue to keep prices low and the quality high. Texas Travertine’s mission is to empower our visitors to make an informed decision when purchasing travertine products. To achieve this mission we regularly supply value adding content to further educate about travertine. As the popularity of travertine has grown the industry has seen wider range in quality of travertine products. Some companies have preyed on the vulnerability of less versed customers and have overpriced and mis-marketed the quality of their stone. Before becoming a go-to flooring option travertine begins as a limestone mineral that is usually deposited by hot springs. A natural phenomenon a rapid precipitation causes much of the coloring of the stone. As owners of over 13 quarries where this occurs our team is able to hand select the finest stones to fabricate and create a final product with unmatched precision. 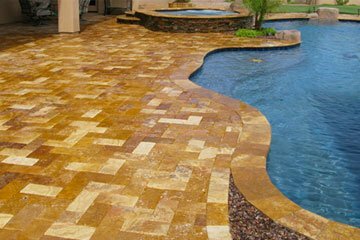 These products ultimately become travertine tiles, mosaic, split face, pavers, and copings. In addition to the aesthetic beauty travertine has become a go to product for many of it functional capabilities as well. As a pavement it provides a unique slip-resistant grip. 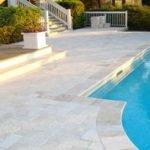 This along with its heat resistance has made travertine a favorite for outdoor and particularly pool sidings, pavers and copings. French Pattern, Versailles, or Ashlar? Trying to decide on French pattern, Versailles, or Ashlar travertine tiles and pavers – well, the choice may be easier than you think. If you’ve been scouring the stone market in search for the perfect travertine tile or paver but can’t decide on a particular pattern you like, the choice may be easier than you think. Although the names are different, French, Versailles, and Ashlar pattern are all pre-assigned patterns of travertine with the same dimensions, size, and layout. These patterns are compromised of a 12-piece set that covers an area of 16 sq. ft. The patterns are pre-assigned with a combination of four pieces of 8” × 8” and 16” × 16” and two pieces of 8” × 16” and 16” × 24”. Patterns are distinguished by colors gradients. Despite the name difference, there is little difference in the pattern. For instance, the name “French pattern” is mainly used in the South, especially in Texas, Oklahoma, and Florida. In the east coast, the term “Ashlar pattern” is coined to represent this combination of travertine. West coast distributors have opted out of using Ashlar or French and call it “Versailles pattern”. In the stone market, distributors and sellers are notorious for not naming things uniformly across the industry. This is why you may have a “coffee” colored travertine paver you like in French pattern but another distributor may have a “cappuccino” colored paver in Ashlar pattern – despite them being exactly the same. 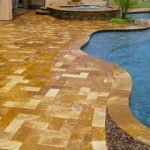 It’s important not to be swayed by the names of the travertine pavers and tiles and focus on the color and pattern you want instead. 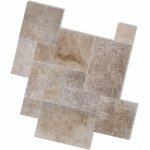 You may start to feel frustrated when you reference “mocha” pavers in Versailles pattern and the seller you’ve chosen doesn’t have it, although they may but with an entirely different name. Tips: Focus on colors and patterns, not so much on names. If you attend stone outlets or markets, take pictures of the color you like or specific styles so that you can show the seller later without confusion. Don’t get frustrated if you’re not finding exactly what you want, chances are that they have what you’re looking for. At Texas Travertine all of our products come in a French pattern or in 6×6, 6×12, 12×12, or 12×24, 16×16, 16×24, 24×24 size pieces. Review our product listing to find the color and style you want. Feel free to send us an email or call about any inquiries you may have. Finding the right color of travertine or any stone can be a daunting process due to the range of color gradients and industry names that frequently change based on the distributor, but with knowledge of what to look for in your next stone can help eliminate the unnecessary stress. It may have taken weeks and many searches online, but when you finally decided to make the commitment to buy the “Alaskan Silver” color of travertine pavers for your outdoor project and your distributor only had “Silver” or “Shell Stone”, you felt a sting of frustration – a problem we hear too often from our clients. The good news is, despite the myriad of hues and their given names, a lot of names are decided by the distributor, even though the patterns or stones may be the same. Finding the right material for your next project is extremely important, but color can help express individual tastes, preferences, and really set your project apart from others. The color of travertine is made naturally and cannot be manufactured or replicated, which is why each groove and color in a travertine tile or paver is truly unique. Travertine is a form of pure calcium carbonate and releases carbon dioxide once its heated, which is why its commonly found in warmer regions where there are a lot of precipitation, or in colder climates where there is a presence of hot springs. Travertine gets it color naturally once it’s exposed to extreme temperatures. Travertine becomes white, red, yellow, orange, and brown once the carbonate material aragonite is activated through extremely warm temperatures and precipitation. 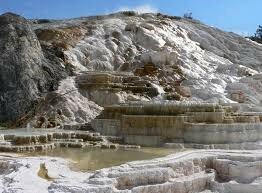 Travertine gets the gray, white, and yellow, and sometimes green color from calcite, which is released in cooler temperatures where hot springs occur. Due to the formation of travertine, all of the tiles and pavers come in pre-assigned patterns. Travertine is arranged based on the size of the pieces and are put together in a consistent way so that your project looks natural. 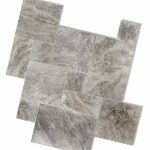 You won’t have to worry about piecing together each tile, paver, or mosaic – that is already determined and it is guaranteed to match. In order to avoid backing out on your design because you can’t find the pattern with the exact name, here are some tips to help you navigate the warehouses or online travertine stores. Next time you are trying to find the perfect color for your project, avoid looking at names and focus on the patterns or colors that make your project pop. Take pictures or get samples of the travertine you like, so you can keep in mind what you’re looking for. Consult a professional at Texas Travertine so that we can help closely match, if not get the exact color you want. Remember not to get frustrated if you can’t find travertine matching with the same name, usually the names range even though the travertine is the same! Visit Texas Travertine so we can help find a match that’s right for you. In the last few years, the amount scams, incomplete work, and unfair payment amounts reported to the Better Business Bureau regarding contractors has been steadily increasing, here are some tips to choosing the right contractor for your Travertine tile install! Choosing the right travertine tile contractor shouldn’t be the hardest part of your pool deck or home remodel, but if you choose the wrong one, it can create significant problems long-term and cause stress until the project is completed. It’s important to be mindful of the process and avoid hire someone that doesn’t have the proper credentials or refuses to ask questions. Here are some tips for hiring the best tile contractor for you. 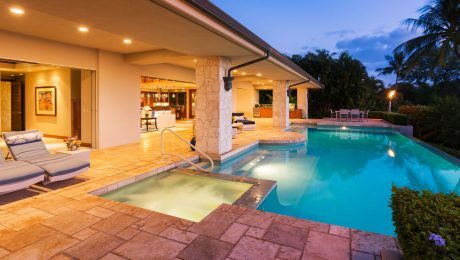 Even if you are trying to create a pool that is the talk of the neighborhood and rivals your neighbor’s newly installed pool deck, it may be best to use their contractor. Referrals are a great way to find a travertine tile contractor because it could prevent you from overpaying or being scammed. It may also be helpful to review past contracts and negotiations if you have never done it before. Referred contractors are also more likely to do a good job if they know that someone you knew liked their work or they may give better rates. 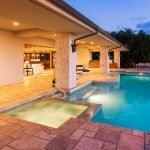 Although knowing someone who’s used a contractor in the past may be helpful, sometimes it may not be the best fit for your project or you may not be getting the best workers – so if your cousin’s son just started a tile contracting business, it may be a good idea to go over other options too. It’s all too common that people hear about horror stories of travertine tile or home contractors over charging for work, not completing the work, or making fraudulent claims – so it’s important that you protect yourself from scams. One of the most important things to make sure before hiring is to check to see if the contractor is “bonded”, insured, and has the correct license. The Better Business Bureau website https://www.bbb.org/en/us/ is a good place to start. The BBB requires that all contractors are bonded and insured. If a contractor is bonded it means that if they don’t complete the work or the work is not done correctly, then you are financially protected. Also, you need to ensure that the contractor is completely covered by insurance and not partly. For example, are all the contractor’s workers covered? Asking the contractor for the correct license is helpful. Most of the proper licenses are held from the National Kitchen & Bath Association, the National Association of the Remodeling Industry and the National Association of Homebuilders. Even if a friend of family member referred the contractor, it’s important that they have all the proper documentation, full insurance coverage, and are listed on the BBB. It’s common practice to interview at least three tile installation contractors before settling on one to do your project. Before you set up the interviews, it’s best to have a good idea about what you want your project and design to look like, so that you can get an exact estimate for what you want. In the interview process make sure that the contractor is specialized for the type of project that you need and that they are using the proper tools to complete the project. You don’t want to hire a contractor that has done work on your cousin’s bathroom, but can’t correctly install tiles for an indoor walkway, even if the contractor says it’s the same. No question is a bad question. Make sure to go over everything before getting started, especially costs, time constraints, installation patterns, insurance coverage, credentials, and past work history. Even if a contractor is busy, it may be worth the wait because if they are in high demand it usually means they have a lot of clients due to their promising work. So don’t hire someone simply because they are available, waiting a few weeks may make all the difference between something that you love! Most tile contractors have worked on travertine projects before, don’t be afraid to ask them for references of their past work or for a portfolio. Most reputable flooring contractors will provide you pictures of designs from previous projects, if they don’t have one or have just started their work as a contract, don’t fret yet. But make sure you are showed something before the project begins to ensure that you aren’t getting cheated. At Texas Travertine, we want to ensure that your project is exactly how you want it, so ask us for recommendations on contractors or project ideas! If you are planning to use travertine pavers to build your pool decking, have an idea in mind of what you want. Compare previous installs of friends and neighbors, or compare pictures online to get an idea of the scope of your install. If friends don’t mind sharing pricing with you, it’s a great way to estimate what you might expect to pay. If you are doing a remodel or new home construction and want to use travertine backsplash or travertine flooring in the home, have an idea of the linear footage of your backsplash, as well as the approximate square footage of the flooring area where you want to install the tile. If you can have these dimensions in mind, it will come in handy to help you estimate the cost of materials. This is important because it could be less expensive to buy the travertine through a local or online dealer and just pay for the install, rather than budgeting a turnkey job. If you have any questions, please feel free to contact us anytime. We are more than happy to help you plan your next travertine tile install! Designing your next indoor or outdoor project but don’t know what type of stone to use? Here are 5 benefits for using travertine materials, so that you can get the design, style, and look you want without the worry. Your project is important, and you want everything to be perfect so you can enjoy your new space, but picking the right material may be a long, frustrating process. Although some stones may be referenced more frequently when you’re doing design research, travertine is one of the best stones to use compared to the alternatives. 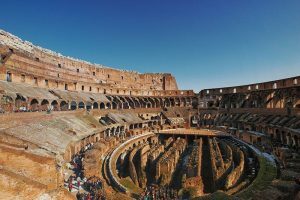 Travertine materials are extremely durable and long-lasting, check out the Colisseum in Rome if you don’t believe us! 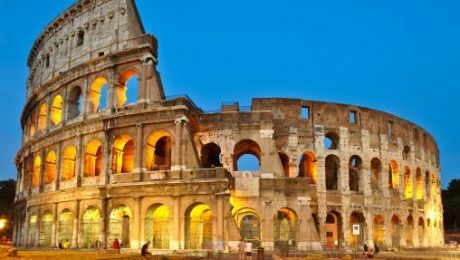 The architectural wonder was built out of travertine and has managed to withstand seasonal changes and the test of time. The durability of travertine makes it a better solution for outdoor projects, especially in places where the weather is constantly changing and temperatures are extreme. When designing an outdoor or indoor space, you want people to feel comfortable moving or placing things without damaging or scratching the stone – with travertine you won’t have to monitor these activities, your stone will withstand damaged. When you use travertine you rarely have to change or replace travertine tiles or pavers, there’s not a lot of wear and tear. Watching your kids playing around the pool may have led you to yell from the kitchen window, “don’t run around the pool” to try to prevent a dangerous slip, but most of the time kids don’t heed our safety advice. But instead of getting in a screaming match trying to avoid a trip to the ER, purchase travertine for your pool design. Travertine is the safest option when it comes to choosing a lining or flooring in the area surrounding your pool. Travertine is not slippery because the porous nature of the stone absorbs the water, making it the safest option for your pool project. Installing a pool in your backyard as a way to find some relief from the scorching summer heat? Don’t forget to get travertine tiles and pavers as a way to protect your feet. Travertine reflects heat unlike other materials and the nature of the stone allows for it to absorb cooler temperatures from the Earth below. Travertine is also resistant from freezing temperatures, so it won’t be slippery or difficult to walk on during snow season. Remember the granite craze? When builders and homeowners were desperate to build countertops with granite – well, what a lot of people don’t know is that travertine is a much more affordable option and has the same glossy look compared to other stones. Travertine, which can have a matte or smooth finish, is ideal for any indoor project. Stones like granite, marble, and limestone may be more of a household name than travertine, but installing travertine in your project is a much more cost-effective solution and you won’t have to compromise on the beauty of the design. Although travertine is known for its durability, you may encounter a problem and need a tile replaced. For some stones that is an exhausting and a dramatic process, but not for travertine! Installing or replacing travertine materials is a quick and easy process, that won’t be costly. Travertine is also incredibly easy to clean. Depending on the style of travertine you use, hone-finish or polished-finish, you can use regular cleaning products to get out stains or simply clean the surface.With a little bit of maintenance, travertine retains its natural color and shine, making it ideal for years to come! Have a vision of what you want, but don’t know if you can pattern the stone to get exactly what you dreamt of? Well, with travertine, pieces can be cut or shaped in any pattern of design so you can get exactly what you want. Also, the various finishes, colors, and styles of travertine allows for several different options when designing your project. Travertine can be used for walls to linings, ceilings to walkways, the inside of bathrooms to the inside of pools – the uses are endless. The range of styles, cuts, and patterns makes travertine the easiest choice when it comes to picking your stone. Its uses are endless and it can be used for a range of building uses. Don’t limit travertine to just your bathroom or pool, it can even be used for the façade of your house or the structure inside.